Many people often underestimate the importance of having a pool safety sign clearly posted for swimmers to see. Every swimming pool, regardless of whether it is a large public or community pool or a small pool in the privacy of your backyard, has the potential of becoming a dangerous, and possibly deadly, place. As the weather turns warmer, the thoughts of many pool owners turn to getting their swimming pools ready for the summer season. They are eager to take off the cover, vacuum out the pool and treat the water with the necessary chemicals so family and friends can enjoy the pleasures of swimming and playing in the refreshing water. Yet during all the swimming pool preparations, many backyard pool owners neglect to put up any safety signs in their pool areas. After all, everyone knows not to dive into the shallow end of the pool, don't they? Sadly, the answer is No. Each year, people suffer spinal cord injuries, paralysis and death from diving into the shallow end of in-ground pools or off decks and ladders of above-ground pools. If pool owners had posted No Diving in Shallow Water signs, they may not have prevented all the accidents from occurring. However, the warning signs may have prevented some of the suffering by making unthinking divers stop and think before doing something so dangerous. 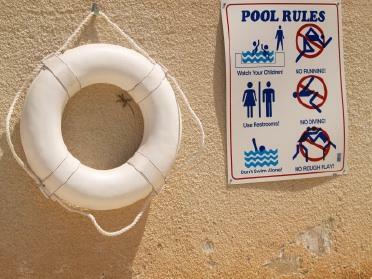 Safety signs for pool areas should be large and written in a way that is simple to read. Often an illustration using simple figures ensures that those that have difficulty reading or have not yet learned to read can understand the sign's meaning. Safety signs should be posted on the gate that leads to a backyard that has a pool. The sign should warn people that there is a pool in the yard. If there is a pool fence around the swimming pool area, safety signs should also be posted there. Signs regarding water depths, diving regulations and the location of the filtration system intakes and drains should be posted near the specific area at the edge of the pool. Safety signs for pool areas are designed to draw attention to potential swimming pool dangers . Many pool signs are appropriate for posting at both public and private pools, while others are only appropriate for one or the other. The following are examples of signs for pool safety. Signs about pool safety are sold in retail locations that sell pools and pool supplies. Many of the larger big box stores also a small selection of safety signs. Pool safety signs help prevent pool related accidents by keeping family and friends aware of the dangers associated with swimming pools and reminding them to follow safety procedures. .